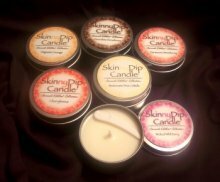 Since 2004, Skinny Dip Candles has offered a complete line of specially created lotion candles featuring high quality, cosmetic ingredients like avocado oil, coconut oil, shea butter, cocoa butter, vitamin E, and more. 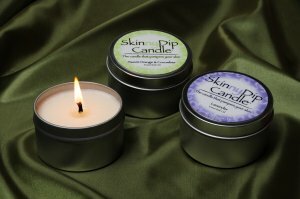 Skinny Dip Candles were the very first massage candles on the market to use premium cosmetic grade ingredients. Often copied, but never matched in quality for the price. Unlike candles made of traditional candle wax, Skinny Dip Candles’ proprietary blend of skin nourishing ingredients result in a candle that melts at just a little over body temperature (about 102 degrees). The rich, warm lotion is the temperature of a luxurious bath – deliciously warm, but never too hot! DIRECTIONS: Simply light your Skinny Dip Candle and let a melt pool form. Extinguish the flame! (The flame itself is always hot so please blow it out before using.) Either dip your fingers directly into the melted oils, or use the scoop included in each tin to dip out a small amount. Use the warmed lotion on cuticles, elbows, heels, or other dry skin areas on the body. Pour the melted oils out of the tin and use the Skinny Dip Candle for massage. Use sparingly because a little bit goes a long way! NOTE: These candles are not meant to scent a room. They are meant to be massaged into the skin.